I am once again attempting to hone my writing skills by entering a short story contest hosted by Theresa Oliver’s Short Story Page. I hope you like it! The basis for my story. Eilain hated her job. It was bad enough that she had to partner with that lech, Thanatos, on the occasional unusual reaping call. But recently, the number of cases had been growing, resulting in her having to spend more and more time rebuking Death’s sexual advances. The guy just wouldn’t give up. It was exhausting. “Knock knock!” a jaunty masculine voice chimed through the closed – and locked – door. Eilain rolled her eyes. Speak of the devil. She sighed heavily, her hands resting on the heavy mahogany desk, and bowed her head in helpless disgust. A moment later, the off-key rendition of Nelly’s Hot in Here assailing her senses from the far side of the door finally spurred her into action. With a resigned heave, Eilain pushed herself back and to her feet. She snagged her Hourglass off of the corner of the desk before padding across the room, throwing the bolt, and hurling open the door. A spark of anger flashed in his sockets. He sneered, “What the matter? Is it that time of the month again? I would think you had better control of that, being the Mistress of Time, and all.” Predictably, he injected overt sexual tones into his pronunciation of her title. “What’s eating you, Lainey?” he murmured, sounding like a whipped puppy, his anger doused by confusion. She turned her back on him, effectively putting an end to his loathsome attempt at conversation, and activated the portal. Holding her Hourglass before her chest with both hands, she took the lead, and stepped decisively through the shimmering black membrane. 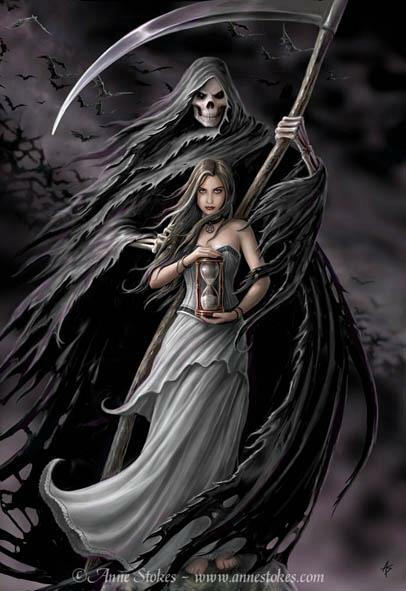 Thanatos followed, one hand on his scythe, the other gripping her right shoulder so they would not be separated in transit. Once they had arrived safely, he quickly removed his bony fingers before she could shrug them off, possibly aware that he was pushing his luck too far tonight. They walked to a small cottage – alone in a misty, wildflower-laden field – in silence. Nothing moved but them. No birdsong reached their ears. No breeze ruffled their hair. A pregnant hush blanketed the surroundings, welcoming them with resigned, bated breath. Entering the cottage, they glided unopposed to the bedside of an exceptionally beautiful woman. She reclined peacefully – her glossy hair artfully spread over silk linens, her lips full and red, her body curvy and voluptuous beneath the thin sheet, the thick lashes of her closed eyes fanning over her flush cheeks. “Is it time already?” the beauty whispered, her voice heartrendingly weak, eyes still shut. “I’m afraid it is, Venus,” Eilain answered gently. She watched the last grains of sand pour through her Hourglass rather than Venus’ perfect face, unable to bear witnessing the death of Love. Eilain closed her eyes. I hate this job. You are so good Tawn. I always look forward to these. Aw, thank you! You are the sweetest thing. I look forward to your posts as well, even though yours are usually a lot more frightening. I tried to lighten things up today though.